Instead of flying direct from Bangkok’s Suvarnabhumi Airport to Koh Samui with Bangkok Airways or Thai Airways, which are expensive, you can get a super cheap flight from Bangkok to Surat Thani and then get the ferry from Surat Thani to Koh Samui. Use the Skyscanner box on the left to search for Bangkok to Surat Thani flights on your chosen dates. 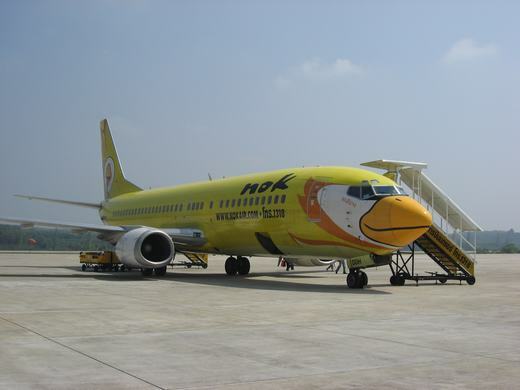 Both Air Asia and Nok Air fly to Surat Thani. However, Nok Air offers a joint flight and ferry ticket service, which included the flight, the transfer to the ferry pier, and the ferry journey to Koh Samui on the Lomprayah Catamaran, which is the fastest and safest ferry to the island. If you want to book this deal, check the Nok Air site directly. Surat Thani is the nearest town on Thailand’s mainland to Koh Samui. Once you fly into Surat Thani, you can get a taxi or a bus from the airport to the ferry pier. The bus costs around 200 Baht per person. When you depart from Samui, you will have to do the process in reverse, getting a taxi from your hotel to the Samui ferry pier, then from the Surat Thani ferry pier back to the airport. Check the Skyscanner website for current times of flights to Surat Thani from Bangkok. You can compare their prices with direct flights to Koh Samui.